Anthony Bourdain's legacy is that he inspired Americans to learn about other cultures across the globe through the food that is shared over a conversation. He was a curious and intelligent traveler, who cut to the quick of what a destination is really like off the beaten path. Bourdain was the king of letting people on his show tell their own stories without claiming that he had discovered anything—he listened and, therefore, was privy to insights that grabbed the viewers attention. Bourdain also, clearly, loved good food—so of course he visited Chicago to feature some of his favorite eateries on CNN's now-defunct show The Layover. On a spring 2016 edition of Parts Unknown, which also aired on CNN, Bourdain featured even more of the city's top, yet underrated eateries. Plus, throughout his media career, he had given the Windy City plenty of love, so we've highlighted some of the very best, from high-end to down-scaled dining destinations. Curiosity more than anything made Bourdain stop over at this deservedly hyped up pastry shop in River North where customers patiently wait in line for up to an hour for doughnuts. Doughnut Vault is adjacent to contemporary American eatery Gilt Bar, and its biggest draw are the artisan treats that change daily and helped kick off the doughnut crazy in Chicago. Popular choices include Old Fashioned, apple fritters and pistachio. There's also a Doughnut Vault-branded food truck that visits popular venues and events throughout the city. A Michelin star recipient several years in a row, L&E first gained recognition for its incredibly satisfying and crave-worthy wild boar sloppy joe paired with beef fat hand-cut fries. 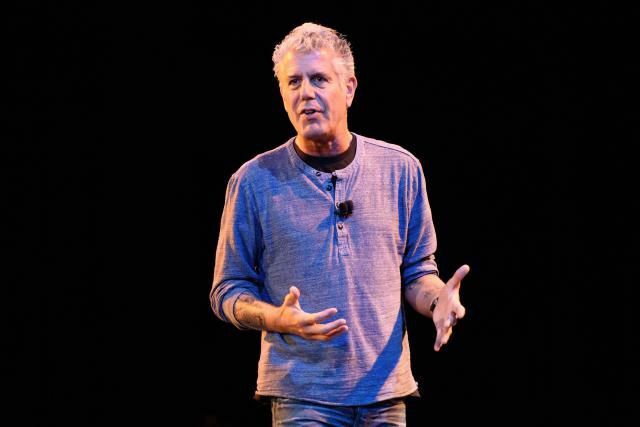 "He loved our pie, and expressed the deepest of disdain for deep dish pizza," says owner Billy Jacobs, who had the pleasure of sharing one with Bourdain at his Wicker Park restaurant in the fall of 2015. Piece's pizzas consist of traditional New Haven-style ingredients with parmesan cheese, oregano and olive oil. Order a Honey Butter Fried Chicken pizza, a topping that was inspired by Jacobs' friendship with HBFC's owners Christine Cikowski and Josh Kulp.